Home » Art » Blog » Comments » Countries » Crafts » Popular Articles » Jeni on Drawing 9 – Drawing is…. Mindless! After all the left and right brain theory about the opposing effects of logic and creativity (see my last blog post) has gone over your head :), here is what I have concluded. Drawing is actually better if you can do it using no brain at all. 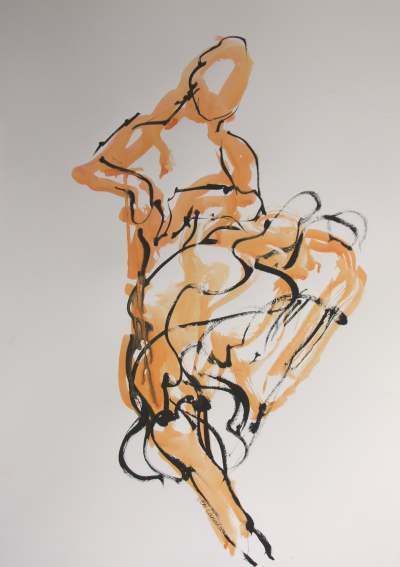 When I was at college I wanted to draw figures in contorted positions as part of a project I was doing. It was to be a child’s mobile hanging and I needed them to have their arms and legs arranged so that I could cut out the figures and then hook them onto each other. My friends weren’t that accommodating. Or flexible. 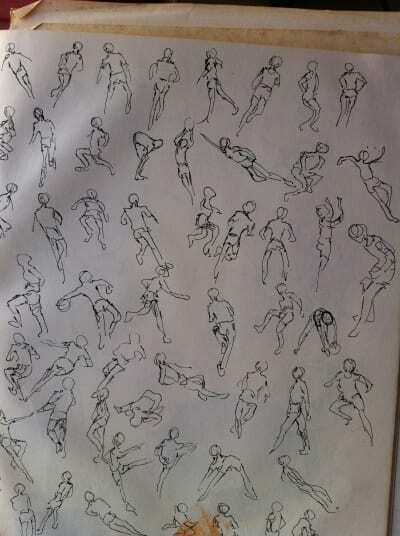 I came up with the idea of drawing moving figures very quickly, and then using them as the basis for my drawings. I had the brilliant idea of drawing footballers on the TV, and spent hours doing just that. Along with the anatomy classes at college and my continuing love for working from live models, I now find that I can work really quickly as long as I manage to switch off and just let it happen. The trick is to watch the figure for a while until you have a feeling for the way they are moving. Sometimes I really feel that I am dancing the flamenco, or playing the guitar (I can’t do either), and so the drawing kind of comes from the inside out. Once I have that connection, I can take a mental snapshot and then draw it out before it fades, not looking back until I have finished. 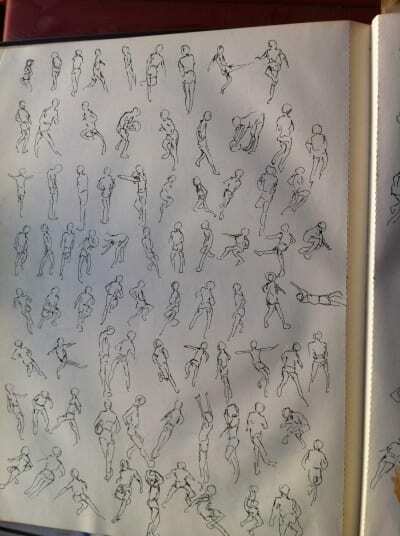 Musicians are slower to draw than dancers as they tend to have a repeated position that I can go back to and build on. 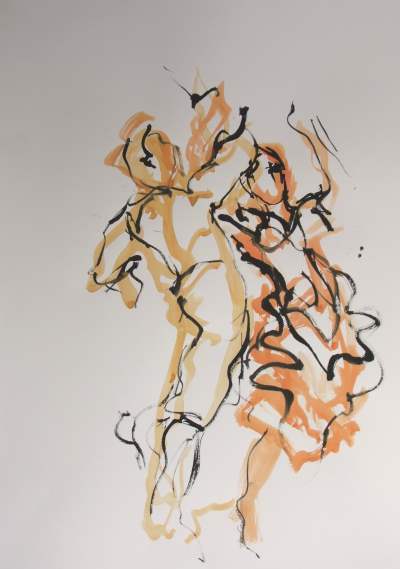 Dancers are a great challenge as the drawing has to be instant. I was asked if I would like to paint a lovely performance “Mu-Danzas Boleras” at the prestigious Manoel Theatre in Valletta. I was given a box next to the stage – which I covered in plastic sheeting and had some real fun drawing with watercolour and ink. I am asked sometimes why I don’t make life easier for myself and just draw from photographs – but where would the challenge or fun be in that? The end results might be more realistic, but they would not have the sense of movement and energy that I revel in. All I have to remember to do is disengage my brain (it’s getting easier with age) because otherwise I get in my own way and can’t draw a thing. And then afterwards I have to stop myself from trying to ‘correct’ them, as that tends to deflate them, and me, too. « LA COCINA TRADICIONAL MEXICANA.